Miko Peled, the author of The General’s Son: Journey of an Israeli in Palestine, is now working on a book about the plight of the Holy Land Foundation Five. In August, the Israeli authorities stunned the humanitarian-aid world when they arrested Mohammad El Halabi, the manager of Gaza operations for the international (Christian) aid organization World Vision, accusing him of having funneled millions of WV’s dollars to the benefit of Hamas. WV President Kevin Jenkins vigorously contested the Israeli allegations. But the damage has already been massive: WV has been forced to lay off dozens of employees and contractors in Gaza. This is far from the first time that Israel has used secret evidence and untried allegations of “aid to terrorism” to shut down charitable efforts being made to help Palestinians. One major precedent for this—in which the U.S. Department of Justice played the lead role—was the case brought (and re-brought) against the U.S.-based Holy Land Foundation for Relief and Development (HLF). In December 2001, the U.S. government shut down the HLF’s operations, freezing all its assets. In July 2004, U.S. agents arrested five top HLF leaders, bringing many charges against them of cooperation with Hamas. (The charges were based in good part on evidence given in secret by two anonymous Israeli security officers.) After that first trial resulted in a hung jury, the government ordered a retrial, and in 2008 it won guilty verdicts against all five men, sentencing them to between 15 and 65 years in federal prison. I am researching a book about the grave travesty of the U.S. legal system represented by the case of the HLF Five. I have interviewed four of the men in the very remote, high-security prisons to which they were sent, and many of their family members. And I have seen at first hand the devastation the joint U.S.-Israeli witchhunt has visited on these people’s lives– and on those of the thousands of families inside occupied Palestine who once relied on aid provided by the HLF. Let me backtrack and tell you more about the HLF, and about what the U.S. and Israeli governments did to it. HLF was established in in the United States in 1989 in order to provide much needed support to Palestinians in their homeland and in refugee camps around Palestine. This was the time of the first Palestinian uprising, or Intifada, and the need for relief in the West Bank and Gaza was great. Palestinians in the United States and around the world saw their countrymen and women being shot, beaten and arrested by Israel and they were ready to help. Indeed, Arabs and Muslims everywhere were looking for ways to help the Palestinian people during that time and HLF provided the means to do so. By the time it was shut down in December of 2001 HLF had become the largest Muslim charity in America, raising around twelve million dollars per year, and it had developed an outstanding reputation both domestically and internationally. Around 1993, allegations started to be made that HLF was providing funds to Hamas. The Dallas Morning News began publishing articles to that effect and the FBI began a covert operation to monitor the organization’s activities. The phones in their offices were tapped, as were the personal phones of their main officers. Hotel rooms where they stayed were bugged and the FBI put agents and informants in place. In an invasive investigation that lasted almost fifteen years no wrongdoing was found. Every penny was accounted for and all of HLF’s work was found to be aboveboard. In 1995, President Bill Clinton signed into law a bill that placed Hamas on a list of terrorist organizations, along with other groups and organizations that were opposed to the Israeli Palestinian peace process. The logic behind this move was that by opposing the peace process these groups were somehow undermining U.S. national security. HLF’s officers and their lawyers went to speak to key people in the Departments of Treasury, State, and Justice to make sure that the organizations with which they were working overseas were not on any “terrorism” list, and to ask if there was anything more they could do to make sure they were abiding by all U.S. laws. The answers they received were vague. That was true– but it was not enough. HLF sued the government to release their assets and undo the designation as a terrorist organization, expecting fully that their evidence would be permitted and their arguments heard. They had an overwhelming body of evidence to counter the government’s claims of funding Hamas. But U.S. District Court Judge Gladys Kessler, dismissed the case without explanation, striking all of HLF’s evidence from the record. Upon appeal the court upheld the judge’s decision even though they admitted mistakes were made and the case should not have been dismissed. But, the court said, since this was not a “normal” case, they would uphold the lower court’s ruling. 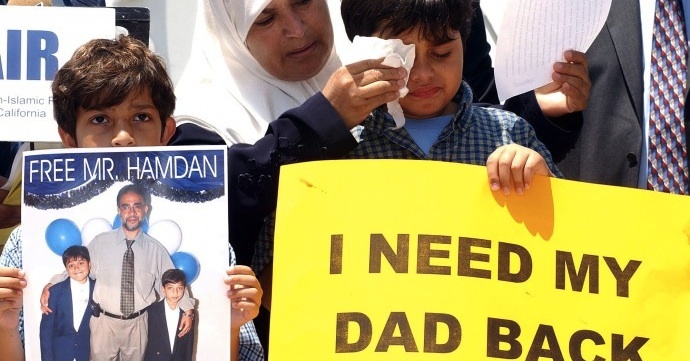 On July 27, 2004 at 7:00 AM central time, federal agents and local police raided the homes of five Palestinian-American Muslim families, arresting Shukri Abu-Baker, Ghassan Elashi, Mufid Abdulqader, Mohammad Elmezaine and Abdulrahman Odeh. These men thenceforth became known as the Holy Land Foundation Five, or HLF-5. They were charged with providing material support to a terrorist organization, Hamas by giving money to Palestinian charities in the West Bank and Gaza that were allegedly associated with Hamas. These charities, known as Zakat committees, are local Palestinian charity organizations with which US-AID, the State Department, the International Red Cross and most other international aid organization work on a regular basis. In July 2007, three years after the men were arrested, they were brought to a first, extensive trial in the Northern District of Texas. One of the witnesses for the defense was Ed Abington, who earlier served four years as the U.S. Consul in Jerusalem, that is, the de-facto ambassador to Palestine. In his testimony, Abington confirmed that the Zakat committees were vetted and were known to be reliable and there was no evidence connecting them to Hamas. After three months of trial and nineteen days of deliberations the jury remained deadlocked. Judge Joe Fish, the presiding judge, declared a mistrial. A year later, in September 2008, the U.S. government started a second trial. This time, the court allowed new evidence and guilty verdicts were handed down to all five men. During sentencing, presiding Judge Jorge Solis handed down severe prison sentences to all five men. Shukri Abu-Baker and Ghassan Elashi each got 65-year sentences. Mufid Abdulqader got 20 years and Abdulrahman Odeh and Mohammad Elmezaine each got 15 years. When the 2008 convictions were appealed, the appeals court recognized that allowing the new pieces of evidence was an error. However, in a move that HLF lawyer John Cline called, “The most ridiculous, dishonest, indefensible call by a federal court I ever saw in my life,” the appeals court declared these errors “harmless” and denied the appeal– even though these errors were not harmless but had brought about the guilty verdicts and the harsh sentencing. The story of the HLF-5 had enormous consequences on the wellbeing of people in Palestine who had previously relied on the HLF’s aid programs, and a strong chilling effect on the Arab and Muslim community in the United States. One can safely assume that the actions Israel has more recently taken against World Vision in Gaza will have similarly dire consequences on the people of Gaza. Let’s hope that the chilling effect that it has reportedly had on the willingness and ability of international aid organizations to work with partner groups in Gaza is not too severe, and is only short-lived.